Forex News: The pair continued on a downward path yesterday but price action was mostly choppy due to the lack of economic releases. The speech of ECB President Draghi did not have a strong impact on the single currency. Bearish momentum is starting to fade as we see more and more candles with long wicks and also, the pair hasn’t made any significant advances yesterday. This suggests that a move up will soon follow but as long as the pair is trading below 1.1825 and below the 50 period Exponential Moving Average, the bias is negative. Today the US jobs data will have a strong impact on the pair’s direction, so the technical aspect will be secondary. There’s nothing important on the calendar for the Euro but the US Dollar will be heavily affected by the most important US jobs report: the Non-Farm Employment Change (aka Non-Farm Payrolls). The report shows changes in the total number of employed people, excluding the farming sector and is a leading indicator of consumer spending. The time of release is 1:30 pm GMT, the expected reading is 198K (previous 261K) and higher numbers are beneficial for the US Dollar. 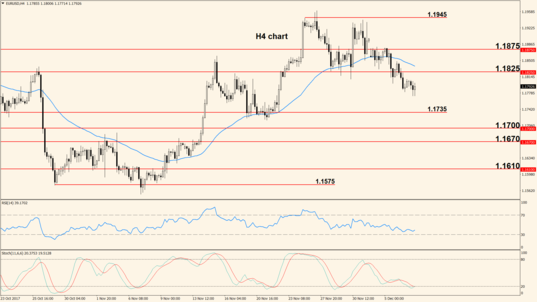 The pair dropped into the support at 1.3320 early in yesterday’s trading session but the Pound recovered the losses after an EU official mentioned that progress has been made on Brexit negotiations. The pair’s movement remains very dependent on any Brexit news that come out without warning but from a technical perspective, as long as price is not clearly above the 50 period Exponential Moving Average, the bias remains mostly bearish. Of course the US Dollar will be affected today by major employment data, so the technical side will be overshadowed by the release. The British Manufacturing Production is today’s only notable indicator for the Pound. The report shows changes in the total value of goods produced by manufacturers and usually has a medium impact on the currency, with higher numbers strengthening it. The time of release is 9:30 am GMT and the expected change is 0.1%. 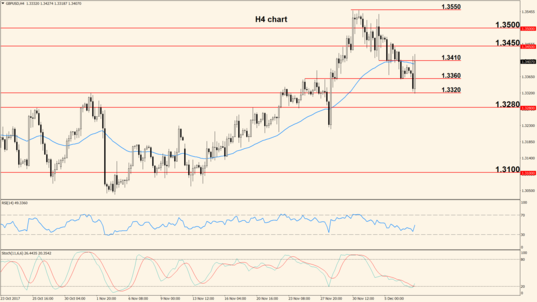 Forex News: The Non-Farm Payrolls released Friday showed a better than expected reading but the previous value was revised lower and this generated a mixed reaction and a perfect bounce at support. The target at 1.1735 was touched Friday and price reacted to it by bouncing higher but the medium term bias remains bearish as long as the pair is trading below the 50 period Exponential Moving Average. After the current bullish retracement is complete, we expect to see a break of 1.1735 and a consequent move into 1.1700 but today will most likely be a slow day, with price trading in a relatively tight range. The JOLTS Job Openings will be today’s only release worth mentioning, although this indicator has a negligible impact most of the time. It shows the monthly number of job openings, excluding the farming sector and usually strengthens the US Dollar if the actual value surpasses estimates. The time of release is 3:00 pm GMT and the forecast is 6.03 Million. Even before the U.S. jobs data came out Friday, price started to drop and the Non-Farm Payrolls added more fuel to the US Dollar, taking the pair into support. A minor bullish move was seen late in the afternoon but the session was overall bearish. The bulls failed to take the pair above the resistance at 1.3500 and this is another blow to the medium term uptrend. The picture is mixed but the bounce at 1.3360 will most likely trigger a climb above the 50 period Exponential Moving Average and above 1.3410. However, if this resistance zone holds and rejects price, we will probably see a break of 1.3360. The Pound has a lacklustre day ahead, without any notable release. This may translate into a slow and ranging trading session. 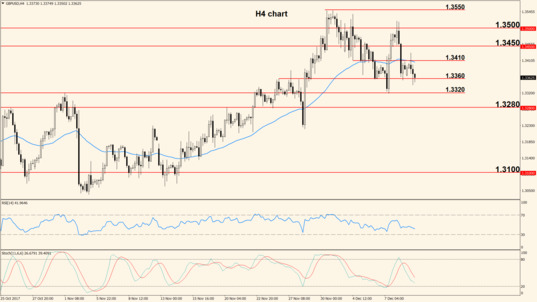 Forex News: Yesterday the economic scene was calm and without any major data releases; however, the pair continued higher at a relatively slow pace and touched the 50 period Exponential Moving Average. 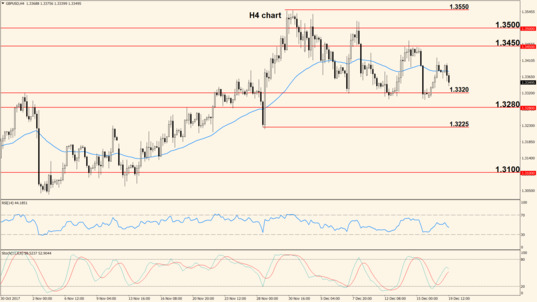 The last few bullish candles are showing wicks in both their upper and lower parts, which may suggest that the retracement started at 1.1735 is coming to an end. If the 50 period EMA is surpassed, we expect to see a move into 1.1825 but at the moment it seems like the pair is lacking the strength to break that mark. A bounce lower at the 50 EMA will make 1.1735 the new target. The German ZEW Economic Sentiment will be released today at 10:00 am GMT, showing the opinions of about 300 German analysts and investors regarding a 6-month outlook for the German economy. This is an indicator of economic health and optimism, thus higher numbers than the anticipated 17.9 can strengthen the Euro but the impact is usually medium. Later in the day, at 1:30 pm GMT the US Producer Price Index will come out, showing changes in the price that producers charge for their goods and services. The forecast is a change of 0.4% and higher numbers strengthen the US Dollar because the indicator has inflationary implications. 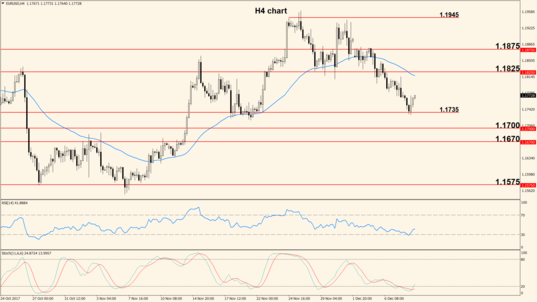 The pair had a choppy trading session yesterday, amid a lacklustre economic environment. Neither side was in clear control but an early climb was quickly reversed. The bulls tried yesterday to move price above the 50 period Exponential Moving Average and 1.3410 resistance but the attempt resulted in a long rejection candle and a drop into the support at 1.3360. The pair’s direction today will be heavily influenced by the British inflation data, so the technical aspect will be somewhat secondary but if the pair stays below the 50 EMA, we expect to see a drop into 1.3320. At 9:30 am GMT the British Consumer Price Index will be released, showing changes in the price that consumers pay for the goods and services they purchase. This is the main gauge of inflation, so higher numbers usually strengthen the Pound. The expected reading is 3.0%, same as previous. Forex News: The U.S. Producer Price Index released yesterday matched analysts’ expectations of 0.4%, so the release didn’t generate strong movement. However, the session was controlled in most part by the bears and the pair touched support. The support at 1.1735 rejected price several times in the past and acted as a strong barrier, so a break would mean a big victory for the bears and would take the pair into 1.1700 in the very near future. Our outlook is bearish, anticipating such a move but also, we expect a retracement if price hits 1.1700 mark. The US Dollar will be affected by the Fed rate announcement, so we may see choppy price action until the release. The main event of the day will be the Fed rate announcement scheduled at 7:00 pm GMT and followed shortly after (7:30 pm GMT) by Fed Chair Yellen’s press conference. The Fed is expected to hike the rate from the current <1.25% to <1.50% and if this is the case, the US Dollar will likely see a boost of volatility, so caution is expected. Earlier in the day, at 1:30 pm GMT the U.S. Consumer Price Index will be released and since this is one of the main gauges of inflation, higher numbers than the forecast 0.4% will likely strengthen the greenback. Yesterday the British CPI posted a value of 3.1%, above the expectations of 3.0% and this initially created Pound strength but immediately after, the US Dollar took over and erased all Pound gains, creating a choppy session. 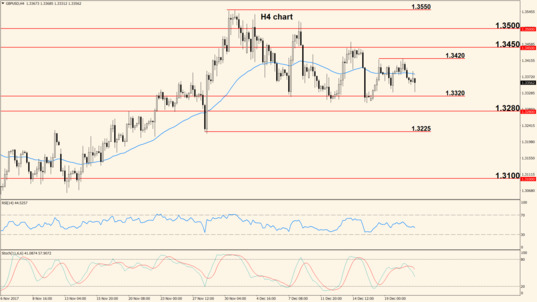 After a spike that took price briefly above 1.3360, the pair descended and is now testing 1.3320 support on the back of mild US Dollar strength. It must be noted that the candles have long wicks in their upper part, which is a sign of rejection at resistance and increased bearish pressure, so we expect to see a break of the current support (1.3320) and a move into 1.3280 where a pullback may occur. The British Average Earnings Index will be released today at 9:30 am GMT, showing changes in the price paid by employers for labour. The expected change is 2.5% (previous 2.2%) and higher numbers are beneficial for the Pound. The pair will also be affected by the Fed announcement later in the day. FOREX NEWS: FED RATE ANNOUNCEMENT IS DONE. ECB AND BOE NEXT! Forex News: The Fed hiked the interest rate to <1.50% as it was widely anticipated but the Rate Statement didn’t show a hawkish stance and this allowed the pair to climb. Also, Fed Chair Yellen mentioned uncertainty about inflation in her press conference and this further weakened the US Dollar. The pair bounced at 1.1735 support and broke the 50 period Exponential Moving Average with authority but stopped at 1.1825 at the time of writing. We expect this resistance level to be broken and price to head into 1.1875 in the near future. If the pair bounces lower from the current level but still remains above the 50 EMA, the outlook remains bullish, anticipating a move into the next resistance. The ECB will announce today at 12:45 pm GMT the interest rate, which is not expected to change from the current 0.00% but the release will most likely create increased volatility. Later at 1:30 pm GMT, ECB President Mario Draghi will hold his usual press conference where he will read a prepared statement and then will answer journalists’ questions. This second part of the press conference is known to be a strong market mover, so caution is recommended because the impact cannot be anticipated. At the same time (1:30 pm GMT) the U.S. Retail Sales are released, showing changes in the total value of sales made through retail outlets. The impact is usually high and numbers above the forecast 0.6% strengthen the US Dollar. Similar to the Euro, the Pound capitalized on the Fed rate announcement yesterday and the pair moved to the upside, surpassing the 50 period EMA and making the short-to-medium term outlook bullish. Downside movement stalled around 1.3320 and price jumped into 1.3410 after the Fed rate announcement and press conference. 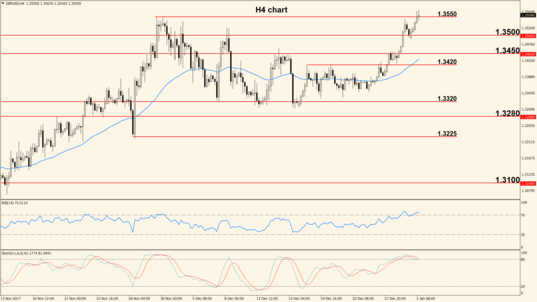 The bullish momentum is likely to take the pair above the current resistance and closer to 1.3450 – 1.3500. A retracement will follow if the pair reaches these levels but as long as price is trading above the 50 EMA, our bias is bullish. The first release of the day will be the British Retail Sales, scheduled at 9:30 am GMT and expected to show a change of 0.4%. The indicator usually boosts the Pound if it posts readings above forecast and the opposite is true for values below expectations. At 12:00 pm GMT the Bank of England will announce the interest rate but since no change is anticipated for quite a long while, we expect the event to create only moderate volatility unless surprises happen. Forex News: The ECB left the interest rate unchanged as expected and the Euro had a mixed reaction, first spiking higher and then retracing into the 50 period Exponential Moving Average. The US Dollar on the other hand, was boosted by better than expected Retail Sales and this contributed to the drop. The pair is now showing a candle with a very long upper wick, which is a clear sign of rejection; however, the US Dollar is still lacking strong momentum and the pair is testing the 50 period EMA, so we are dealing with a ‘bounce or break’ scenario. If the Moving Average will be broken, the pair may try to break 1.1735 again and otherwise, we expect to see a move above 1.1825 and closer to 1.1875. Today we don’t have major announcements, so we may see a ranging trading session. The U.S. Industrial Production will be the most notable release of the say, scheduled at 2:15 pm GMT and expected to show a value of 0.3%, lower than the previous 0.9%. The report tracks changes in the total value of goods produced by factories and has a positive impact on the greenback if it posts a higher than expected value. The Pound was boosted in the early part of yesterday’s trading session by upbeat British Retail Sales but it had a muted reaction to the BOE decision to maintain rates unchanged, as expected. Later in the session the US Dollar recovered some of the early losses and took the pair into support. As long as the pair is trading above the 50 period Exponential Moving Average, the bounce at 1.3450 can be considered a simple retracement so the outlook remains bullish. Today’s price action will likely take place between the 50 EMA and 1.3450 and a break of one of these boundaries will probably trigger a stronger move in that direction. However, the economic calendar is light today and this could translate into a slow session. The United Kingdom didn’t schedule major economic releases for today so the technical aspect will decide the pair’s direction. Forex News: The pair came under pressure Friday after failing to break above the 50 period Exponential Moving Average and finished the week in negative territory. The US Dollar has now erased all losses incurred after the FOMC Meeting. Price is now very close to a bullish trend line and early in today’s session we expect to see a break or a bounce at the said trend line. A bounce higher will take price into the 50 EMA and a break will probably trigger a move into 1.1700 territory but given the lack of major economic releases, we don’t expect to see a break of the 50 EMA or 1.1700 support. The Eurozone Final Consumer Price Index will be released today at 10:00 am GMT and this will be the only notable event of the day. The CPI shows changes in the price that consumers pay for the goods and services they purchase and acts as the main gauge of inflation but the Final version has a low impact; nonetheless, numbers above the forecast 1.5% usually strengthen the Euro. Friday the pair dropped on the back of Brexit concerns and lost more than 100 pips, finishing the week in negative territory. However, price is still ranging from a longer term perspective and support is still holding. 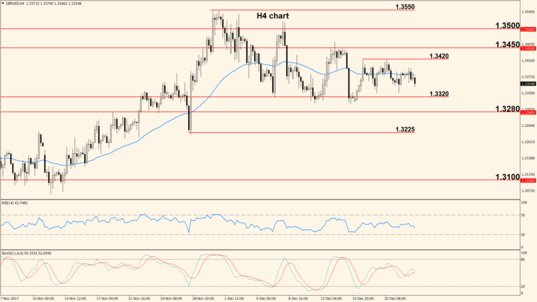 The support zone around 1.3320 – 1.3300 rejected price twice in a relatively short period and now it is being tested again. After Friday’s strong drop, we will likely see a small pullback but as long as the pair remains below the 50 period Exponential Moving Average, our bias is bearish, anticipating a break of 1.3320 and a consequent move into 1.3280. The Pound has a lacklustre day ahead, without any major economic releases. Brexit talks and negotiations can affect the currency, so caution is recommended. 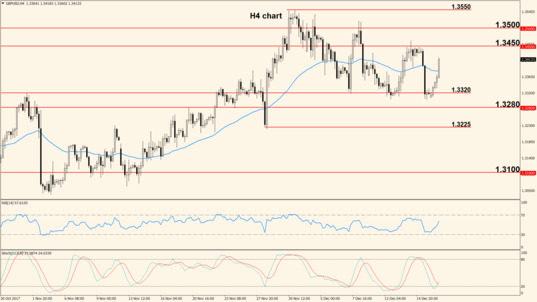 Forex News: The German political scene was one of the catalysts behind the pair’s push above the 50 period Exponential Moving Average seen yesterday. The US Dollar weakened on concerns regarding the long awaited U.S. tax reform bill. 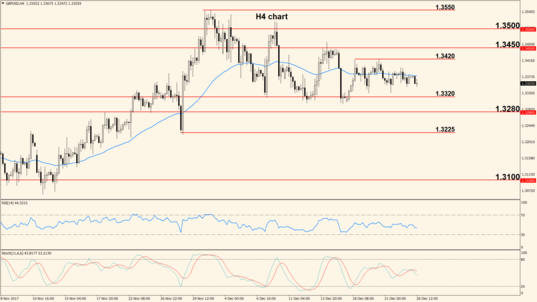 The pair has climbed above the 50 EMA with strong bullish momentum and is now testing the resistance at 1.1825. If this level will be broken, we expect price to climb into 1.1875 region where the Relative Strength Index will probably become overbought, signalling a retracement. If 1.1825 will reject price lower and the bulls cannot keep it above the 50 EMA, we will probably see a return into 1.1735 during the days to come. The German IFO Business Climate survey will be today’s highlight for the Euro, showing the opinions of about 7,000 businesses about a 6-month outlook for economic and business conditions in Germany. The time of release is 9:00 am GMT and the expected reading is 117.6; higher numbers show optimism, strengthening the single currency but the impact is low-to-medium. On the US Dollar side the most notable release will be the Building Permits, scheduled at 1:30 pm GMT. This is a good indicator of future activity in the construction sector and usually a reading above the forecast 1.28M (annualized number) strengthens the greenback. 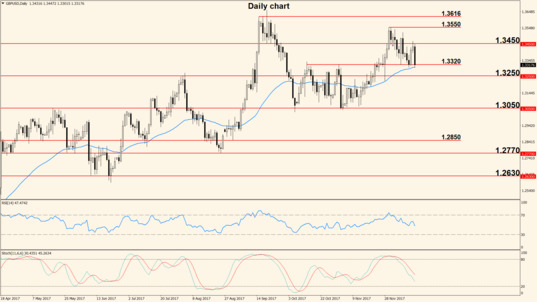 US Dollar weakness was the main driver of yesterday’s price action. The pair erased most of the losses incurred Friday and is now trading above the 50 period EMA once again. As seen from yesterday’s price behaviour, the pair doesn’t have a clear bias and all moves are reversed even if they look strong at first. Two levels are key for medium term movement: the support around 1.3320 and the resistance at 1.3450. As long as price is trading above the 50 EMA we expect it to reach 1.3450 but until one of the key levels is broken, out bias is mostly neutral. The Pound has a light economic day ahead, without any major releases scheduled. Price action can be affected by Brexit negotiations so the pair remains high risk. 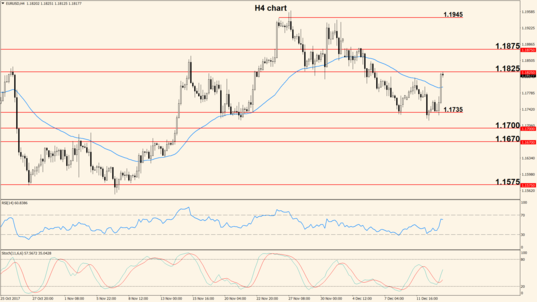 FOREX NEWS: RESISTANCE HOLDS, BEARISH PRESSURE INCREASES. CAN THE US DOLLAR MAKE A COMEBACK? 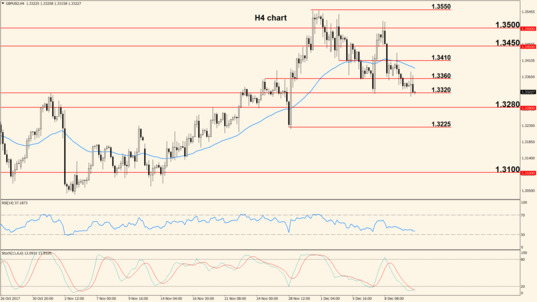 Forex News: US Dollar weakness persisted throughout yesterday’s trading session and the pair reversed an earlier drop that found support near the 50 EMA. The German IFO Business Climate survey came slightly below expectations but the impact wasn’t major. Currently the pair is testing 1.1825 resistance for the second time in a short while but the latest candle is showing a long wick in its upper part, which is a sign of rejection. If the current resistance cannot be broken, we expect to see a drop through the 50 period Exponential Moving Average and a move closer to 1.1735 in the near future. 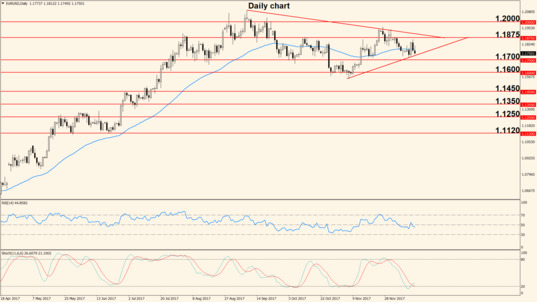 The pair is in a range, so we expect choppy price action until a clear breakout occurs. At 3:00 pm GMT the US Existing Home Sales will be released, showing how many houses were sold during the previous month, apart from new buildings. The indicator usually has a low-to-medium impact but higher numbers than the forecast 5.53 Million (annualized number) can strengthen the US Dollar. The Pound bulls failed to keep the pair above the 50 EMA, so yesterday’s trading session was mostly controlled by the bears but price action remained choppy. The failure to continue upward after the initial break of the 50 period EMA shows that bearish pressure is increasing and that we will most likely see a touch of 1.3320 support. The pair remains in a range from a longer term perspective and today’s direction will probably be influenced by the testimony of BOE Governor Carney. At 1:15 pm GMT, Bank of England Governor Carney will testify before the Treasury Select Committee on the topic of the November Financial Stability Report. The event is likely to generate increased volatility, so caution is advised. 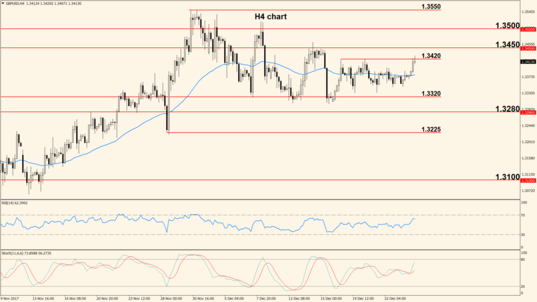 FOREX NEWS: EURO BREAKS OUT. FAKE MOVE OR THE START OF A BULL RUN? 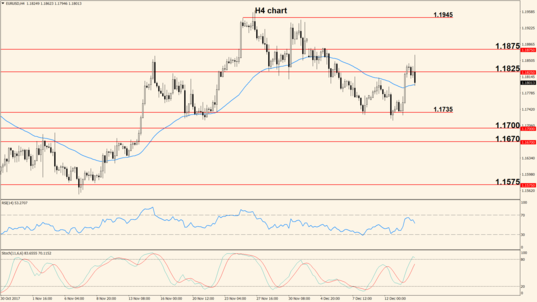 Forex News: The early part of yesterday’s trading session was choppy and without any major developments; however in the afternoon the Euro bulls managed to take the pair above resistance, despite a better than expected reading for the U.S. Existing Home Sales. The pair is now trading above the resistance at 1.1875 but the bullish move was mostly triggered by the technical side rather than the fundamental because yesterday no major economic data came out. If the bulls can keep price above 1.1875, we will probably see an extended move north, with 1.1945 as target but this will be reached in more than a day probably. A quick return below 1.1875 will negate the bullish momentum and will make 1.1825 the first target. The main event today will be the release of the Final version of the US Gross Domestic Product, scheduled at 1:30 pm GMT. The GDP measures the annualized change in the total value of services and goods generated by the economy and acts as the main gauge of economic performance but the Final version tends to have the lowest impact. The expected reading is 3.3%, same as previous and higher numbers strengthen the greenback. 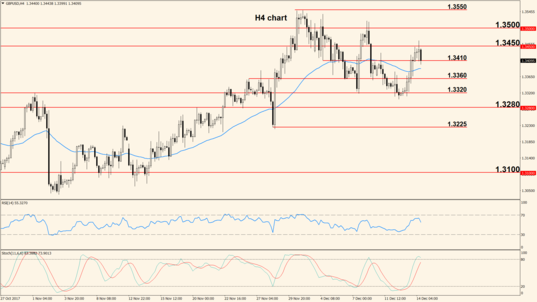 Price action remained choppy throughout yesterday’s session and the testimony of BOE Governor Carney went mostly unnoticed. However the pair climbed above the 50 period EMA and the bias was bullish. Lately the pair’s movement is lacking a clear direction and the 50 period Exponential Moving Average is moving almost flat, further showing that the pair is in range mode. Upside momentum is almost non-existent so if the pair cannot break the previous top at 1.3420, we expect to see a drop through the 50 EMA, en route to 1.3320 area. The only notable Pound affecting release will be the Public Sector Net Borrowing, scheduled at 9:30 am GMT. It shows the difference between spending and income for the Government and public corporations but has a medium-to-low impact on the currency; higher values than the forecast 8.3 Billion are beneficial for the Pound because a negative number means surplus and a positive one means deficit. 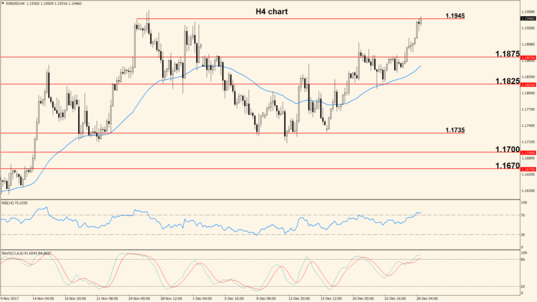 Forex News: Yesterday the pair remained in a choppy and tight range, without any major developments. 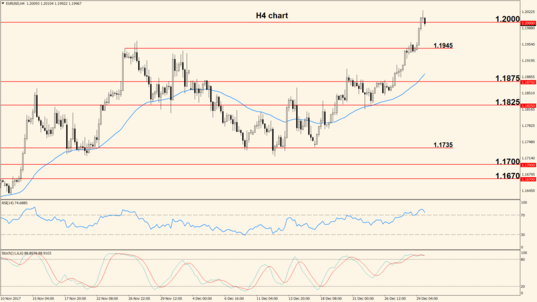 The bulls failed to capitalize on the break of resistance and price returned below the level. The lack of major economic announcements contributed to this behaviour. The break of 1.1875 didn’t generate a strong continuation climb and soon the pair retraced lower but the bearish move lacked strong momentum and the entire session was choppy. As long as the pair is still trading above the 50 Exponential Moving Average the bias remains bullish but this doesn’t exclude a drop into the 50 EMA and the support at 1.1825. Another break of 1.1875 resistance should be considered a true break only after a full bullish candle closes above the level. Today we have two economic releases that can affect the US Dollar: the Durable Goods Orders scheduled at 1:30 pm GMT and the New Home Sales at 3:00 pm GMT. Higher numbers for these indicators usually strengthen the US Dollar but their impact is low-to-medium and are not known to be major market movers. The expected change for the Durable Goods Orders is 2.1% (much better than the previous -0.8%) and the forecast for the New Home Sales is 654K (previous 685K). The pair wasn’t affected much by the economic indicators released yesterday but drifted lower and continued to show choppy movement. Price is still in a range, without a clear bias. Until the pair breaks 1.3320 or 1.3420, it can be considered in a range and we can expect to see reversals on the lower time frames. Yesterday price moved below the 50 EMA then tried to return above it but failed and this is a sign that bearish pressure is increasing; however, the last candle also has a long wick, which is a sign of indecision. 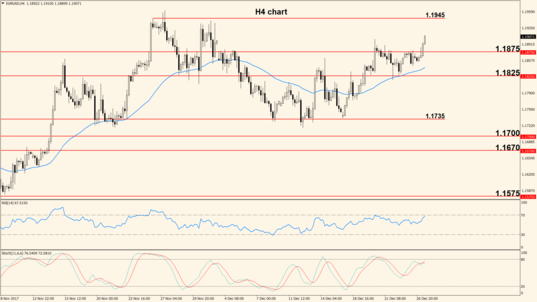 Our bias is slightly bearish for the short term, anticipating a touch of 1.3320. The British Current Account will be released today at 9:30 am GMT and expected to show a value of -21.5 Billion. It measures the difference between imported and exported goods and services and has a medium impact on the Pound. Numbers above expectations usually strengthen the currency. At the same time the Final version of the British GDP is released but the impact is relatively low. However, higher numbers than the anticipated 0.4% have a positive effect on the Pound. Forex News: After a dip Friday the pair bounced at support and pushed higher but remained in a range. The economic data was mixed and did not have a strong impact on the pair’s direction. Today price action will come to a halt due to the Christmas Holiday. It is possible to see small and/or erratic movement but most Forex brokers around the globe will be closed. Today is Christmas Day, so banks across Europe and in the United States will be closed. The markets will take a breather and the fundamental scene will be totally quiet. The British Current Account released Friday came below expectations but this didn’t have a notable impact on the pair and overall price action was jerky, with a slight bearish bias, probably due to the approaching of the Winter Holidays. Most markets around the globe will be closed today for Christmas, so price action will come to a stop. Beware of possible traces of liquidity which may trigger short-lived movement. Similar to the U.S. and the rest of Europe, the United Kingdom celebrates Christmas today and no economic releases will take place. Merry Christmas to those who celebrate it! Forex News: Markets and banks were closed yesterday due to Christmas and price action came to a total stop. Today some European countries celebrate Boxing Day, so market behaviour will be still uncertain. Price will start to move today but volume will remain thin and price action will be irregular. A technical prediction cannot be made with accuracy but the levels to watch are 1.1875 as resistance and 1.1825 as support. Caution is recommended because we may see alternating periods of very high and very low volatility. Most European banks will be still closed today and although U.S. banks will be open, no major economic data will come out and this will surely affect price action. The pair didn’t show even the slightest trace of movement yesterday due to Christmas, so we pick up where we left off Friday. Price action will resume today but we don’t expect major developments to take place mostly because volumes will be thin and volatility will be unpredictable. Caution is recommended today and in fact for the remainder of the year. UK banks will be closed in observance of Boxing Day and no economic data will be released, which is another reason for irregular and choppy price action. Forex News: Price action resumed yesterday but no substantial developments took place, as it was anticipated due to the low trading volumes. 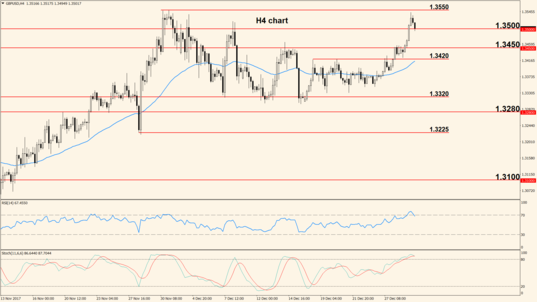 The pair moved higher and reached the resistance at 1.1875 but the level couldn’t be broken on several attempts. This doesn’t necessarily mean that 1.1875 is going to hold, because the pair’s direction will remain uncertain until the markets will gather a bit more volume. We expect choppy trading above and below 1.1875 but we cannot rule out a sudden spike generated by the low trading volume. The U.S. Consumer Confidence survey will come out today at 3:00 pm GMT, showing the opinions of about 5,000 households about the overall economic situation. Usually a higher number shows optimism and strengthens the US Dollar but given the current situation of thin trading volumes, the impact is more difficult to anticipate; today’s forecast is 128.2. As it was expected, price action remained very slow and choppy due to the lack of volume and the pair traded in a very narrow range. Price is moving very close to the 50 period Exponential Moving Average which is flat, so an accurate technical prediction is difficult to make. We expect irregular price action and low trading volumes until the first week of January 2018 but beware of potential spikes. Just like the rest of the week, today is a slow day for the Pound because no major economic data will be released. Forex News: The pair picked up speed yesterday and broke the resistance at 1.1875, trading above 1.1900 at the time of writing. The U.S. Consumer Confidence survey did not have a huge impact on the market and overall volume remained low. Compared to the previous few days, movement was stronger yesterday but volume is still not back to normal and this means that we may see a sharp reversal or a strong climb into 1.1945 – 1.1950. The Relative Strength Index is approaching overbought and this favours a drop into 1.1875, which may turn into support. Our bias is neutral until volume and volatility return to normal. The Chicago PMI will be released today at 2:45 pm GMT, showing the opinions of purchasing managers regarding overall business conditions in the Chicago area. The survey has a medium impact under normal conditions and higher numbers than the anticipated 62.0 usually generate mild US Dollar strength. 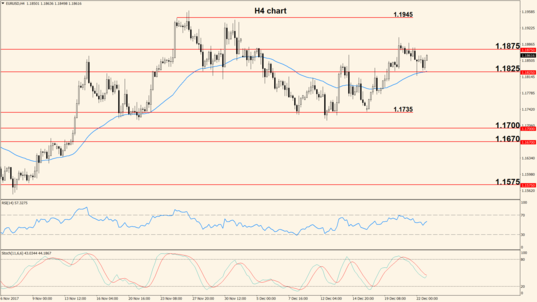 Similar to the EUR/USD, the Cable had a bullish bias yesterday and picked up speed compared to the previous days. However, resistance is still holding and a bounce lower is very possible. The resistance at 1.3420 stopped yesterday’s rally and the pair is likely to reverse at this level, aiming for the 50 period Exponential Moving Average. The bias is mostly neutral and price is still in a range, with low volume overall but a break above 1.3420 will take the pair into 1.3450, which is a level where the chances of a reversal will increase. The United Kingdom didn’t schedule any economic data releases for today so the main price driver will be the technical aspect. FOREX NEWS: FINAL TRADING DAY OF 2017! 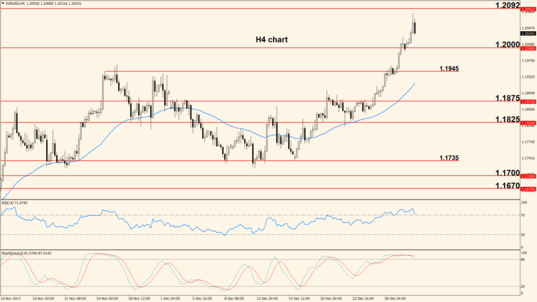 Forex News: The pair continued on a bullish note yesterday and reached the long term resistance at 1.1945. Part of the reason behind the climb was the low trading volume and soft U.S. economic data. Today is the last trading day of 2017 and this means that we may see irregular price action, possible reversals or even strong directional movement, thus caution is advised through the duration of the day. Strictly from a technical standpoint, the Relative Strength Index is in overbought territory and price is facing a strong resistance zone (1.1945 – 1.1950), so we expect to see a bounce lower. If 1.1950 is breached, the next big hurdle is 1.2000 but we don’t expect to see a touch of that barrier. The German Preliminary Consumer Price Index will be today’s only notable release but due to the fact that it’s the final trading session of the year, the impact of this indicator might be muted. Under normal circumstances a higher reading than the anticipated 0.5% (previous 0.3%) strengthens the Euro; the time of release is 1:00 pm GMT. 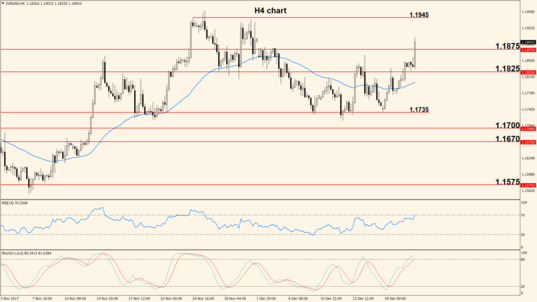 The Pound bulls took the pair above 1.3420 but price paused at the next resistance (1.3450). From a longer-term perspective, the pair is still in a range, without a clear bias. The level at 1.3450 is a key resistance for long term movement, so it’s very possible to see a bounce lower from here but on the other hand, the low trading volume can make it easier for the bulls to break the level. Trading will be affected by end-of-year choppiness, so caution is recommended. Today is yet another lacklustre day for the Pound from a fundamental standpoint as no major indicators will be released. We wish you a Happy New Year and a prosperous 2018! Forex News: The entire last week was bullish and the final trading day of 2017 was no exception. 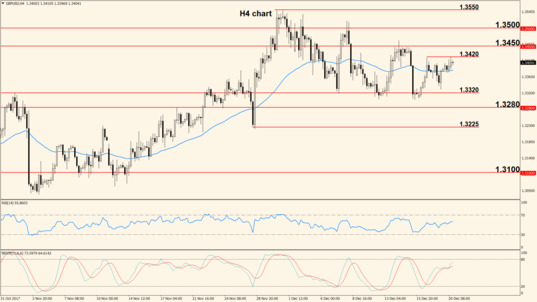 Price broke the key resistance at 1.2000 but then retraced and finished the year very close to the level. The fundamental scene lacked any important releases. Today markets across the globe will be closed and price action will come to a stop. Movement will resume Tuesday. Banks in most parts of the globe will be closed, celebrating New Year’s Day and no economic data will be released today. 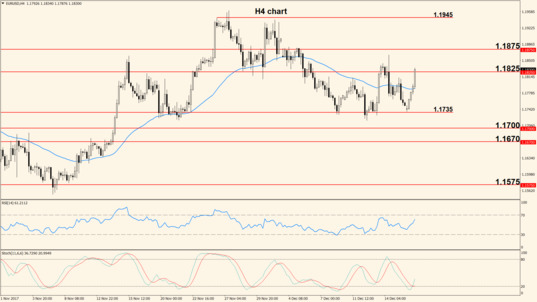 Friday the bulls took price more than 100 pips higher, breaking 1.3500 and approaching 1.3550 resistance. 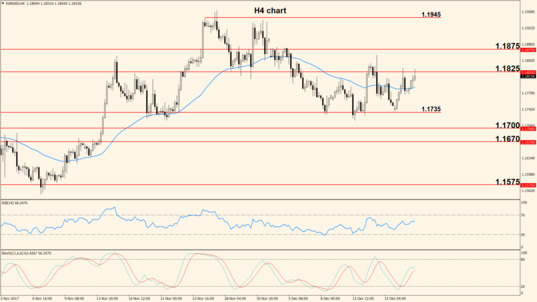 The session ended with a bounce at resistance and a move lower but the bias remains bullish. Today price action across the board will come to a stop, celebrating to New Year’s Day and trading will resume Tuesday. UK banks and financial institutions will be closed today as well, so the markets will come to a stop and activity will resume tomorrow. Forex News: Yesterday the market stood still as people around the globe celebrated the New Year, so we pick up where we left off Friday, right on the ley resistance at 1.2000. Price direction is difficult to predict because the markets are still under the influence of low trading volumes. Strictly from a technical point of view, the Relative Strength Index is deep in overbought territory and the pair is showing rejection after the move above 1.2000. This suggests that a move lower will follow, so it’s possible to see a descent into the previous level at 1.1945 – 1.1950. The pair will not be affected today by any notable economic releases and this may be another reason for irregular price action. Yesterday the pair did not move due to New Year celebrations so today we will get a fresh start with the first trading session of 2018. The near-touch of 1.3550 resistance combined with the overbought position of the Relative Strength Index triggered a rejection lower that brought price very close to the psychological level at 1.3500. If this level will be broken, the pair might continue towards 1.3450 but keep in mind that trading volume is still not back to normal and this may translate into irregular or choppy price action. The British Manufacturing PMI will be released today at 9:30 am GMT, showing the opinions of about 600 purchasing managers about business conditions in the Manufacturing sector. It acts as a gauge of optimism and higher numbers than the forecast 58.0 usually strengthen the Pound but today’s impact is difficult to anticipate. Forex News: Despite being overbought, the pair continued higher yesterday and even approached 1.2092, which is the highest price reached in 2017. Most of the move was due to US Dollar weakness but part of it was erased in the afternoon. Price is deep in overbought territory and it shows rejection after coming close to last year’s high (1.2092). This suggests that we may see a deeper pullback, possibly into 1.2000 but overall the US Dollar is weak against most of its counterparts and the bias is bullish, so once the retracement is over we expect to see a move into 1.2100 area. At 3:00 pm GMT the U.S. Manufacturing PMI will come out, showing the opinions of about 400 purchasing managers about business conditions in the manufacturing sector. Usually a higher than anticipated number strengthens the US Dollar but the impact is relatively mild; today’s forecast is 58.3. At 7:00 pm GMT the FOMC will release the Minutes of their latest rate meeting, outlining the reasons that determined the rate vote. The release has a higher impact if the document contains hints about future monetary policy, so caution is recommended. 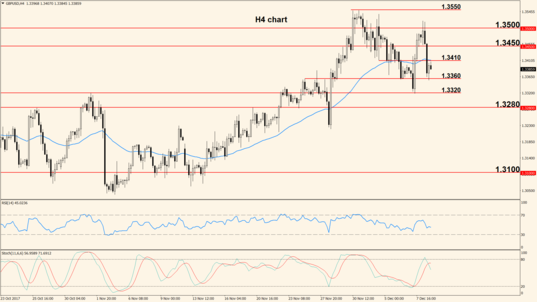 The British Manufacturing PMI released yesterday came below expectations but this didn’t hinder the pair’s climb, which extended into 1.3550 resistance. 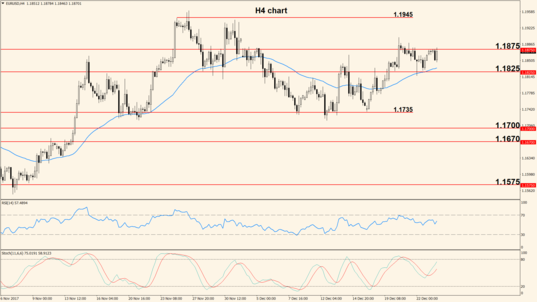 Price bounced at 1.3500, turning this level into support and sending the pair above 1.3550 resistance. The next destination will be the resistance zone at 1.3600 – 1.3616 but the Relative Strength Index is overbought, which is an early sign of a potential pullback. Keep in mind that 1.3550 is an important level, so a clear break will probably bring in additional buyers. The Pound will be affected by construction data in the form of the Purchasing Managers’ Index, scheduled at 9:30 am GMT; the survey acts as a gauge of optimism and numbers above expectations usually strengthen the currency, with a medium impact. Today’s forecast is 53.2, while the previous was 53.1.